The chorus in Zedd & Elley Duhé's "Happy Now" (2018) is repeated 4 times but each time the sonic texture around it is changed, giving it a different musical function and meaning. 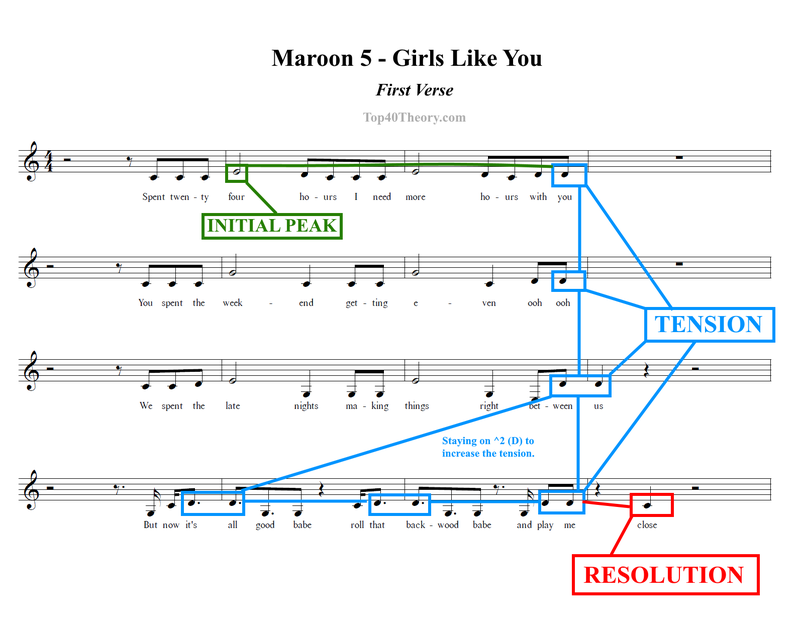 PREVIEWING is another common technique used by Max Martin and many other songwriters and producers. 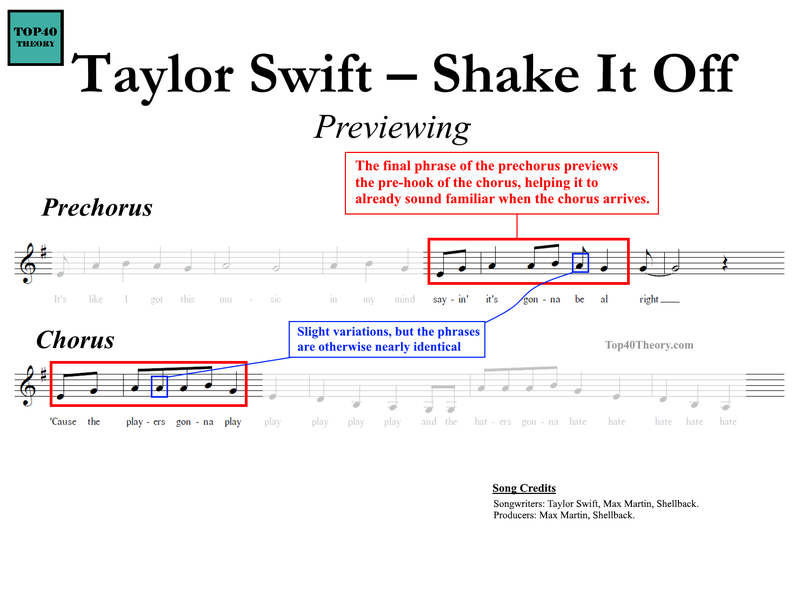 Note how the last phrase of the prechorus in Taylor Swift's "Shake It Off" (2014) previews the first phrase of the chorus so that it sounds instantly familiar. 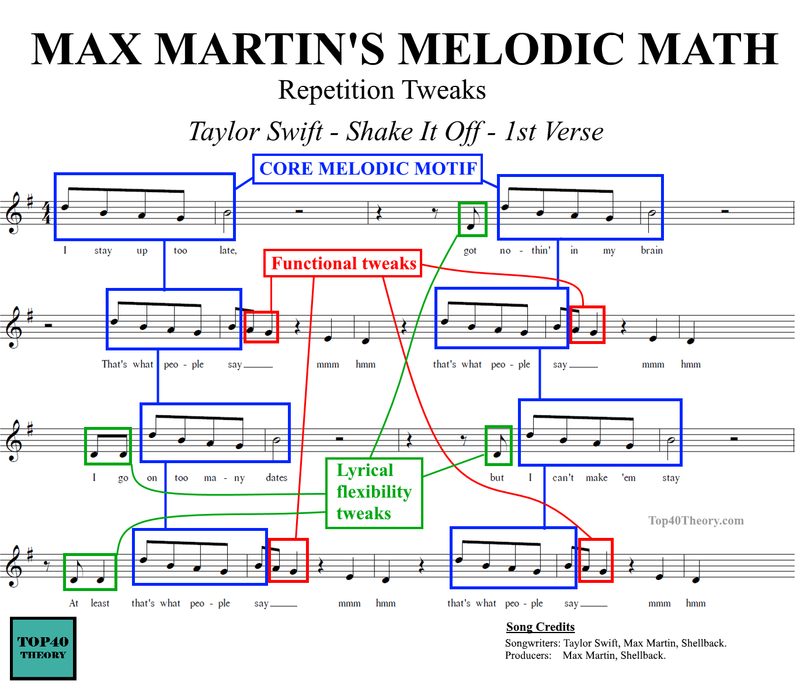 There's a myth about Max Martin's melodic math that all phrase repetitions must be precise. That's not true--while repetitions are very close, Max 'tolerates' two kinds of melodic variations on the core motif: 1. Variations that allow lyrical flexibility WITHOUT harming the integrity of the core motif. 2. 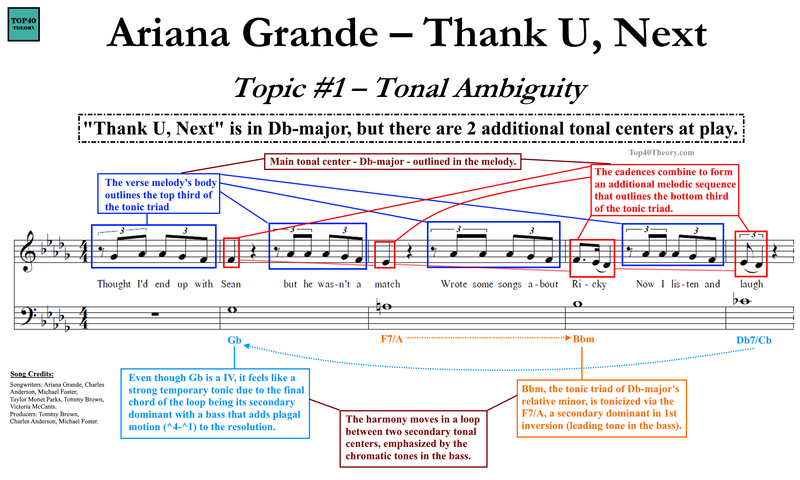 Variations that change the melodic function of the phrase and allow it to fit into a melodic structure (e.g., ABAC). 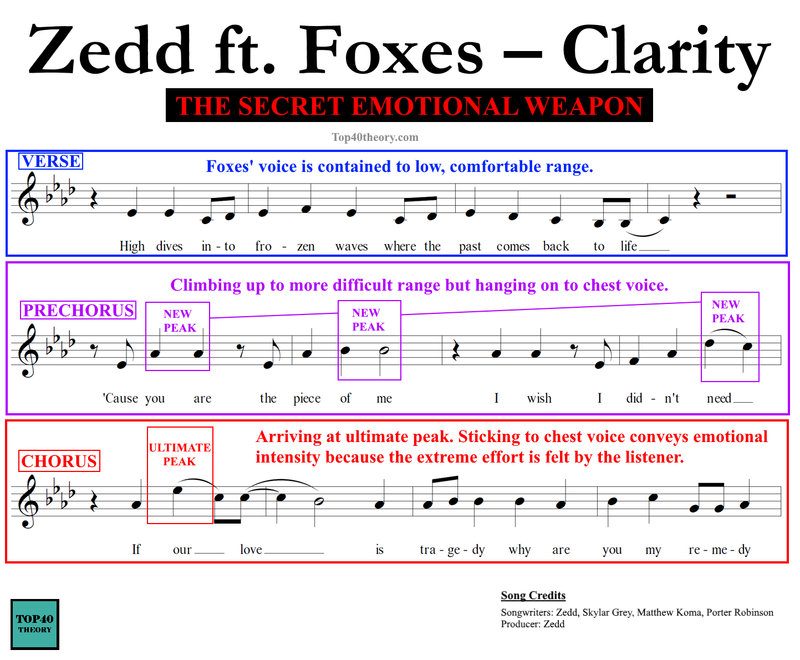 Those have more freedom to tweak core notes but it still has to sound like a repetition. Here's an example from Taylor Swift's ​"Shake It Off" (2014). The sonic development on a section-to-section level (e.g., prechorus-chorus) is usually straightforward to the listener. Most will also notice that on a large scale songs tend to get bigger and more climactic as they progress. But under the hood there are also more subtle internal sonic progressions that likely go unnoticed but contribute a lot to the effectiveness of the overall sonic arc. 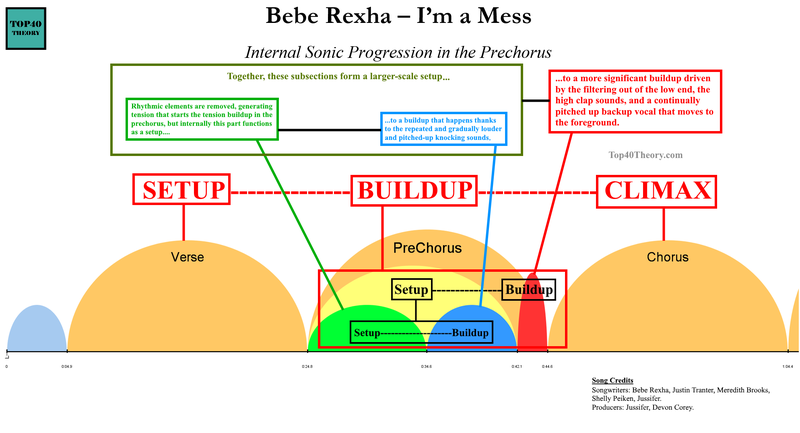 Here's a great example of such an internal progression that happens in the prechorus of Bebe Rexha's "I'm a Mess" (2018).